It’s cold and miserable outside, which is another way of saying “January in Central Pennsylvania.” Hearty food, aka “comfort food,” has always been something people turn to during the dark cold eves of winter. While comfort food for many Pennsylvanians is a pot of stew or a roast chicken dinner, for some Pennsylvanians it’s food from their much warmer homeland. Pennsylvania has relatively large population of Puerto Ricans, and this includes my hometown of York. I had Puerto Rican friends growing up who introduced me to food from their sunny island, such as mofongo, tostones, and arroz con pollo, which means chicken with rice in English. 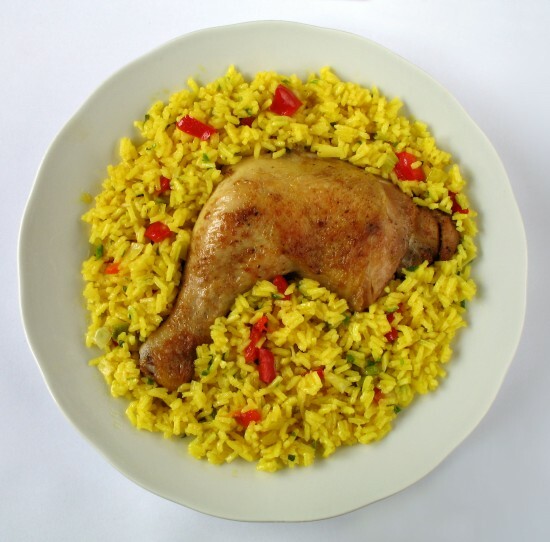 Arroz con pollo is a caldero dish, which means it is made in a large pot or dutch oven. A caldero, a kind of dutch oven, is a standard item in the Puerto Rican family kitchen. There are several steps to making arroz con pollo and it can seem intimidating at first, but it’s a fairly easy dish to make. I like to make it with good local chicken, and I think that bone-in chicken adds the best flavor. The seasoning also makes it a colorful dish. The finished product rice that has a bright yellow-orange color, almost like sunshine on a plate. And, it’s absolutely delicious, a wonderful, unique flavor that’s not spicy-hot. Here’s the recipe, and enjoy your trip to the Caribbean for dinner this week. - Fry chicken for 5-10 minutes each side, make sure chicken is well browned. - Remove chicken and place in a covered pan, such as a casserole dish covered with foil. - Stir in sofrito, olives, capers, Sazón, tomato sauce, bell pepper, and cumin in caldero/dutch oven. - Cook for about five minutes over low heat, stirring on occasion. - Stir in rice. Mix well with the other ingredients, then add the water and bring it to a boil over medium high heat. - Lower heat to low/simmer, return chicken and cover caldero, and cook for about 20-30 minutes or until water is fully absorbed by rice. - Remove from heat, let stand for 10-15 minutes, then serve.